I remember when I thought people who were 35 years old were ancient. Then I thought 40-somethings were dotards. Now that I am 40-something, my perspective of “old” is not 50, or 60, or even 70. “Old” to me is anything over the age of 80. My grandmother, who has dementia, is old. My great-grandmother lived into her 90s — that was old. I will never forget the tale she told me about her daddy butchering hogs at the tree over yonder, when yonder was 85 years ago, and in her mind I was not her great-granddaughter but was instead her daughter. 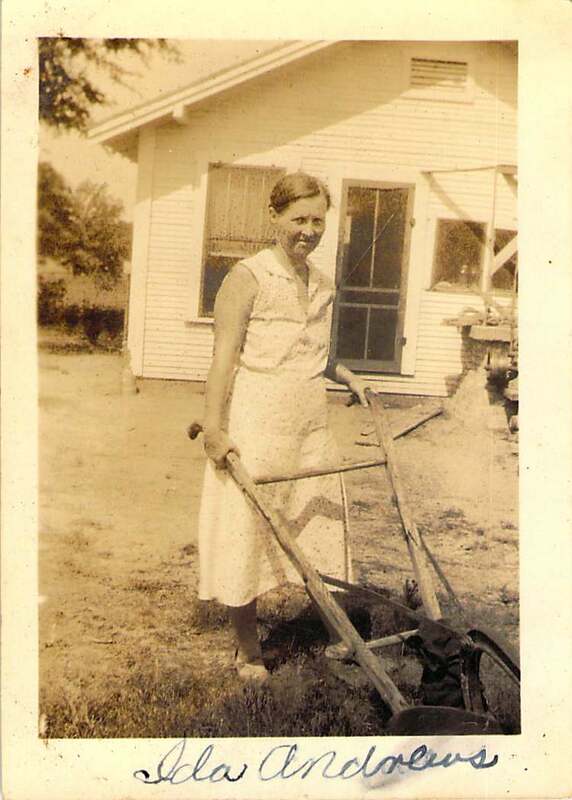 I look at this picture of my great-grandmother man-handling some kind of farming implement (a plow? a tiller? ), in a dress, mind you, and know that when this photo was taken, she was not old. Today I know that 40-something, 50-something, 60-something, and 70-something is not old. My father-in-law’s brother died in his sleep today. At 64, he was not old. In fact, I’d say he was a spring chicken — younger than my dad and around the same age as my mom. Ironically, he died exactly 25 years to the day after his older brother died and had been planning a 25-year reunion of sorts with friends and family to celebrate his brother’s life. Instead, today his friends and family moved about in shock. I will document my journey here. I am doing this for 2 reasons. The first one is for me, kind of a journal, and a way to keep my friends and family informed of what is going on with me. Also, for other people who are fighting cancer who might want to know what has worked, or hasn’t worked for me. The second is for my husband and son, so they will have something from me after I am gone. They can look back on this and know that I fought the good fight and that no matter what happens, I am at peace, as I hope they will be too. At 40-something, my friend is not old. Dying is a part of living, and we are each given only so long to see sunsets, walk in the quiet of the woods, savor the sandy beaches, hold on to our loved ones, and love one another before the candle of our soul blinks out in this life in order to blaze brightly in the next. The irony of the timing of my father-in-law’s brother’s death reminded me of a parable Jesus taught and perhaps brings his message more into focus. This passage is from Luke 12. Jesus had been teaching a crowd when someone asked him to intervene in a dispute about an inheritance. Do you know anyone who has been involved in a dispute about an inheritance? Do not stand between a brother and a sister duking it out over the chipped china dishes! It is time to slow down and take stock, now, for there is no guarantee that there will be a tomorrow for me, or for you, whether we are healthy as horses, battling disease, are somewhere in between — or whether we are 20-somethings or 30-somethings or even 80-somethings. I am prone to procrastination, especially when the chore that needs doing is easier to set aside than face. Like going through my closet and pulling out clothes to give to the poor. Or grabbing extra food at the store so I can drop it off at the food pantry at church. I think to myself that I can go through my closet tomorrow. If I have a disagreement with a friend, I’ve been known to avoid phone calls for a few days, thinking that “tomorrow” I would speak to her and make things right. I’d like to “one day” make a photo book for charity, but that project feels so overwhelming that I’ve relegated it to the pipe dream pile. How about you? Need to reconcile with your brother? Do you think there’s too much to do today and so you’ve been putting it off for tomorrow for the past month? Or year? Have a bag of clothes to donate sitting in the closet but put off taking it to Goodwill today because you can just as easily take it there tomorrow? Are you a bit unsure about whether God exists and not sure if Jesus is for real? There’s plenty of time to wrestle with those tough questions, right? We can make things right with our friends, adopt a child, take clothing and food to the poor, research the info out there about God and Jesus tomorrow or next week or next year or when the kids move out of the house or when we retire or when we get old, right? Wrong. Tomorrow might be too late. I am in the fight for my life. I will say that I have an undeniable peace about me that only Christ can give. I know that Christ will heal me. I believe that my purpose here on earth is not complete. I have asked God to allow me to be here to see my son grow up and become a man. If he will allow me to live, I will live the rest of my days as if they are my last. I will enjoy life, my family and my friends and I will focus on making memories so when I am gone, there will be lots of memories to hold onto. If God decides my time is up, then I will go, happily, to my home in Heaven. I yearn for the day I can see my Saviors face and I can once again see my sister and all those I love who have gone before me. Previous Previous post: Are Allergies Possible With Essential Oils?